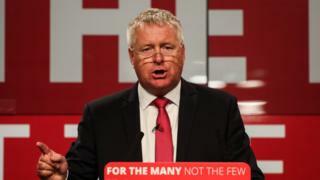 MP Ian Lavery received £165,000 from the 10-member trade union he ran. We have learned this from the trade union regulator which has now released a report into Mr Lavery's actions as general secretary of the NUM Northumberland Area. He will now face questions on his record over a number of disputed payments by the union he ran. Mr Lavery, who is the chairman of the Labour Party, denies any wrongdoing. 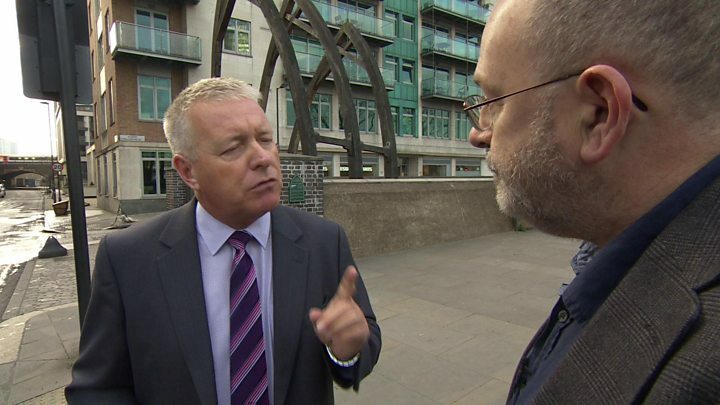 Ian Lavery is a coming power in the land, Jeremy Corbyn's general election joint co-ordinator and chairman of the Labour Party. If the Conservatives fall, he's most likely destined for high office. But, perhaps, for one thing: his refusal to answer a simple question asked by BBC Newsnight last year: "Did you pay off the mortgage?" BBC Newsnight asked him nine times without getting a reply. The answer, it turns out, is no. He didn't pay off his mortgage. The union of which he was general secretary for 18 years, the NUM Northumberland Area, paid it off and paid him much more besides. Last year, both Jeremy Corbyn and the parliamentary watchdog cleared Mr Lavery. He denies any wrongdoing. The reason we know more about Mr Lavery's peculiar mortgage arrangements is because the trade union regulator, the Certification Officer, Gerard Walker, examined the books after investigations by BBC Newsnight and the Sunday Times. Mr Lavery ran the NUM Northumberland Area for 18 years until he stepped down in 2010 to become the MP for Wansbeck. The regulator's findings are available online. The regulator found that that the Northumberland Provident and Benevolent fund had lent Mr Lavery £72,500 to buy a house in 1994. 13 years on, the union Mr Lavery was then running forgave the loan to Mr Lavery. So he was £72,500 the richer. But there's more. He'd been paying into an endowment fund to pay back the capital cost of the house. It had underperformed, but it still paid out £18,000. The regulator found Mr Lavery kept that too. The regulator found that in 2005, Mr Lavery sold a 15% stake in his house to the Union for £36,000. In 2013 the house was worth less, so he bought it back from the union for £27,500 - a notional profit of £8,500. And then there's Mr Lavery's "termination payments", totalling £89,887.83. However, that total is a matter of some dispute between him and the union. The regulator says that neither Mr Lavery nor the union could provide documentary evidence of the process or the decision by which Mr Lavery was made redundant - or why, given he was leaving for a job as an MP, he needed any redundancy payments at all. Adding £89,887 he received for his undocumented redundancy package to the £72,500 for the forgiven house loan to the £18,000 he was gifted from his endowment, that totals £180,387. "Mr. Lavery was adamant that £15,000 was his final offer, we were left with little choice but to accept." So our running total of dosh from the union to its one-time general secretary is reduced by £15,000 to £165,387. That's a bob or two in anyone's language. A year ago, when we started questioning Mr Lavery on this matter, Jeremy Corbyn gave him the benefit of the doubt and the Parliamentary commissioner cleared him of wrongdoing, which he has always denied. Since then, Mr Lavery has risen in Labour's ranks to be one of the Labour leader's closest and most trusted lieutenants. Now that we know just how much money he got from the trade union he used to run, it's fair to ask whether this man is a fit and proper person to be chairman of the Labour Party. "Under my stewardship, the union always complied with the rules and the Certification Officer signed off every year's transactions. As the Certification Officer's report makes clear, no member of the union, past or present, has made a complaint about the financial affairs of the union. I am pleased that the Certification Officer has decided to not appoint an inspector or take further action. "This report should draw a line under almost two years of allegations and innuendo directed at me and my former colleagues. Our legacy is helping miners and their families when others abandoned them, bringing millions of pounds of compensation into the Northumberland Coalfield. I remain immensely proud of our record."